All the major airlines have several flights per day into and out of Japan. There are also a number of low-cost carriers (LCC) operating routes. The major international airports are Narita, Haneda, New Chitose (Sapporo) and Kansai International (Osaka). JAL flies daily from most capitals to Tokyo (Narita International Airport). Japan Airlines is a One World member and Frequent Flyer points are available. JAL offers daily connecting flights from Narita and Haneda to Sapporo. ANA Airways flies daily from major capitals in Asia, Oceania, Europe and the US. 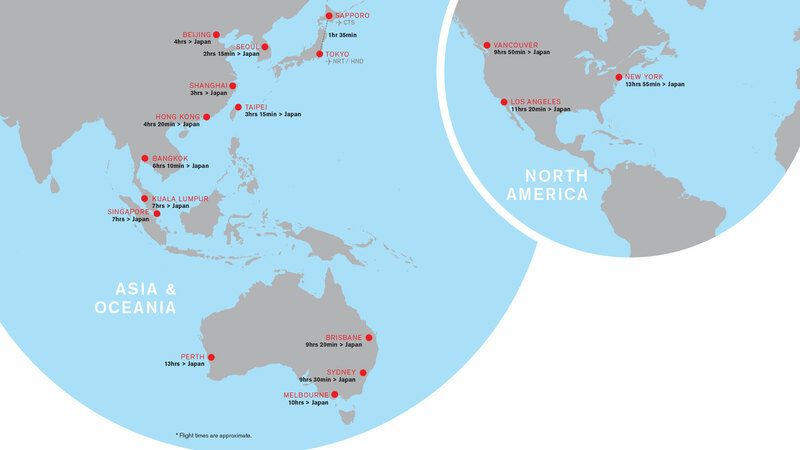 Cathay Pacific flies from most mainland capital cities in Asia via Hong Kong direct to New Chitose Airport and Narita. Cathay Pacific is a One World member and Frequent Flyer points are available. China Airlines flies from Taipei to Tokyo & New Chitose airports. Korean Air flies daily from Seoul to Tokyo & New Chitose airports. Thai Airways(TG) flies from Bangkok to Tokyo & New Chitose airports.